Four successful directors join hands to create a movie as a salute to the centenary year of Indian cinema – a novel idea! Each presents a short story on an aspect of cinema – reminding us of those Doordarshan days when we relished ‘Ek kahani’ and its ilk! There’s no question of not liking the movie in toto – there may be mixed reactions to one or the other story! 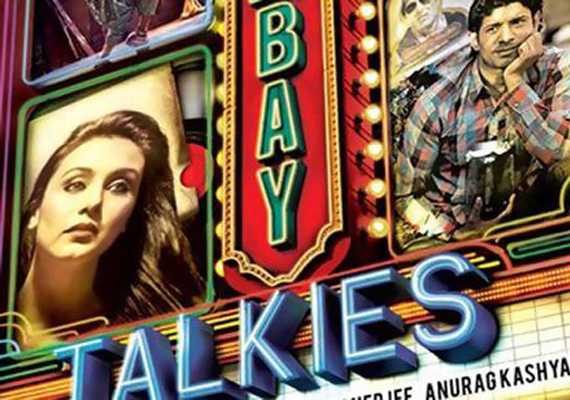 Karan Johar’s theme – as usual is bold and ‘hatke’ – in fact he’s getting bolder and bolder! Though LGBT is not taboo in India any more, parents watching with kids definitely squirm even as the scenes get bolder and reach a crescendo! Rani-Saqib is a delightful ‘pair’! Rani is a natural and so it’s no big surprise. The young Saqib Salim more than matches strides with her with ease and confidence. Randeep Hooda completes the triangle with elan. The old melodies used aptly in the background add to the effect. The volley of punch lines is lapped up by the public. A very well-made story without Karan’s trade-mark frills and fancies – if you don’t mind the adult theme, especially in a movie with all other stories with kids / for kids! The tribute is to all the innovative creators – story / script writers, dialogue writers and directors who have left their indelible stamp on Indian cinema. The next story directed by Dibaker Banerji is an adaptation of Satyajit Ray’s short story. Nawazuddin Siddhique who plays the failed actor accidentally landing up with a ‘face-in-the crowd’ role, is a delight to watch as he grabs at the opportunities to display minute emotions with subtle facial twitches. Authentic shots of chawl and street scenes of Mumbai are a feast to the eyes. The best of the lot is the ‘reading-the-newspaper-over-the shoulder-in-local-train’ scene – even if we have a feeling of having seen it earlier! The highlight is the hazaar ways of uttering the monosyllabic dialogue ‘ay’! The imaginary dialogue- baazi between Nawazuddin and his theatre guru Sadashiv Amrapurkar conveys the acknowledgement of the impact of theatre on our cinema. Zoya Akhtar handles the next story – very typical of kids obsessed with filmy dance / music. This is the age of reality shows and ambitious parents and super-talented kids. But this father (Ranveer Sheorey) would rather enroll his son (Naman Jain) for football coaching but the boy has a flair for dancing (read item numbers). At the climax scene at the “ghar ko multiplex banaake rakha hai”, the multiplex audience (we) as well as those in the movie – begin watching the gyrations of the ‘boy’ with wide-open mouth and raised eyebrows but end up easing those creases and smiling and clapping for his superb performance! “Follow your heart and dreams” is the theme – yes, many have come with dreams and made it big in Indian cinema. But couldn't there have been a better icon than Kat? How can this euology to Indian cinema be complete without the legendary Amitabh Bachchan? Anurag Kashyap’s is the simple rustic tale of the crazy Bachchan fan (Sudhir Pandey) who sends his son (Vineet Kumar) to meet his idol with the home-made ‘amla murabba’, just as his father had sent him years ago on a similar mission to Dilip saab! Mission indeed – as it turns out to be! And the twist in the tale reminds us of Premchand’s short stories! This segment is a salute to millions of frenzied fans like the protagonist and to the legends of cinema. Unique joint venture, hand-picked actors, natural acting, crisp dialogues, simple themes projecting the influence of the Indian film industry on the common man. The first half is crisp, the second half totters. No big surprise that the film ends with a celebration - with a glorious star line-up - paisa vasool!